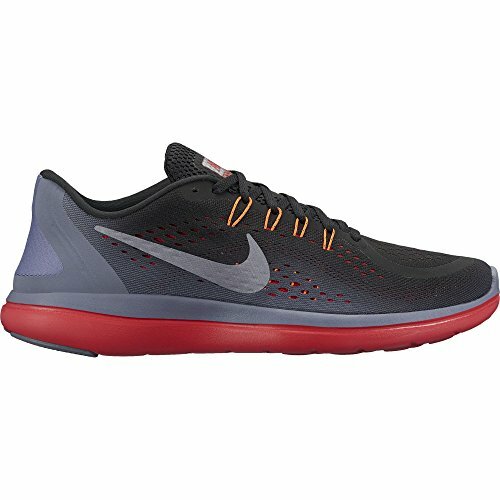 Top to bottom the Men's Nike Flex 2017 RN Running Shoe is built to flex. Its one-piece engineered mesh upper, adaptive heel design and molded tri-star outsole pattern work together for a smooth ride that moves with your stride. Engineered mesh provides breathable support. Tri-star outsole pattern enhances flexibility. Minimal heel design provides a more natural fit. Co-molded midsole uses a softer injected Phylon (IP) core foam directly underfoot and a slightly firmer injected unit sole (IU) carrier foam to deliver comfort and durability for a smooth ride. Heel is rounded for a smooth transition at initial touch down.